Alderney, MP5 Türkenburg Flak. The German positions. Alderney, MP5 Türkenburg Flak. Fort Tourgis. Alderney, MP5 Türkenburg Flak. Fort Tourgis Victorian 1855 (and German 1943). 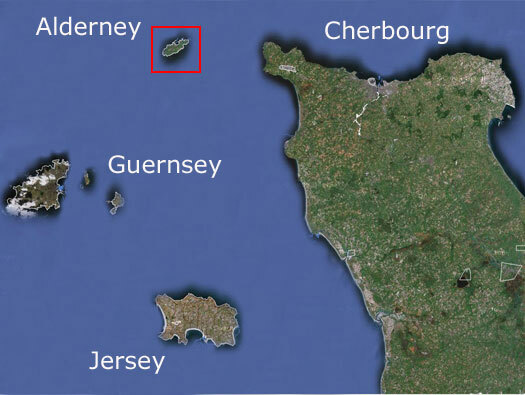 Early Victorians decided that Alderney was a key player in the world of defence of the realm and sent over a detachment of Sappers and Miners to re fortify the island against a French invasion. 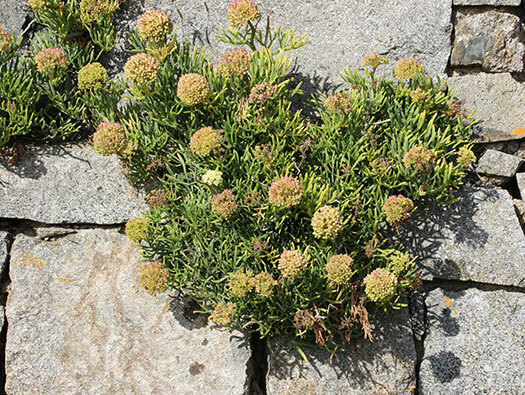 A new harbour was envisaged and a long breakwater was started. Forts were being built around the island and Fort Tourgis was one of them. 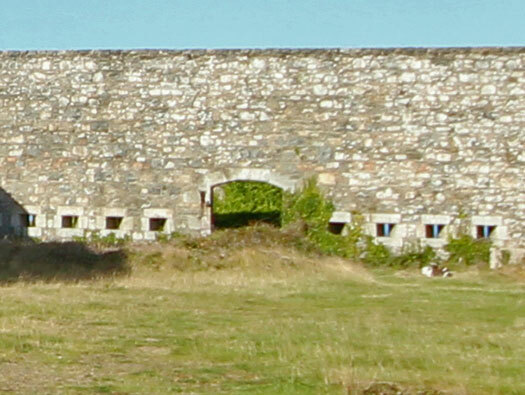 A Fort to cover two bays of the island Clonque and Platte Saline with 33 guns and 346 men and Officers. A massive structure beautifully made of local stone. 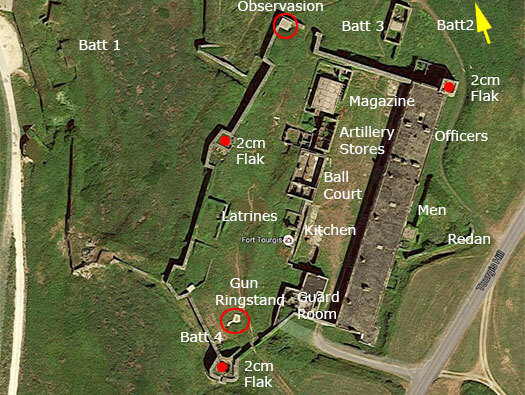 Four battery’s, men’s quarters, Officers quarters, Magazines, Shell stores, Parade ground Kitchens, and a Guard Room. Corps of Royal Sappers Miners. Light Company 25th Regiment of Foot 1855. Fort Tourgis in all its splendour. The original entrance to Fort Tourgis. Main Gate. 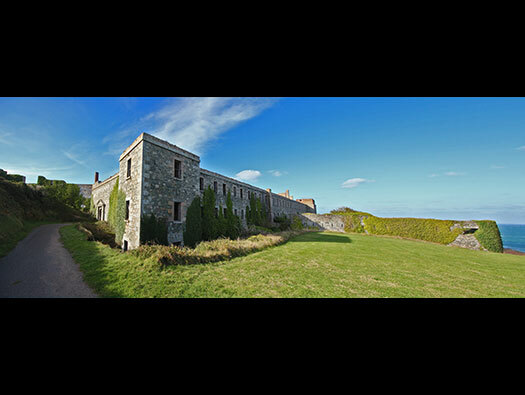 The Germans moved in and I am sure they used the Fort as barracks as it used to held 360 British soldiers. The original door with Tourgis written on it at the top. The sun was very bright and it was in shadow. Ceiling above the guard room, in a bit of a state. Lamp space to light up two cells. Ball Court and Artillery Store. Steps to the next level. What you do not see here is the wind, it was blowing a gale and I had a job to even stand up here. Photo reconnaissance Spitfires flew very regularly over the Islands to find out what was happening with the defences. USAAF Dakotas were shot at on the morning of D-day if they strayed too close. 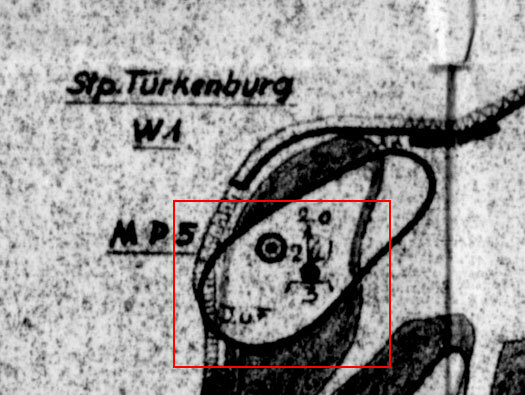 The red arrow shows where I was stood and where the first 2cm Flak 30 was placed. Flak position, on the left is an ammunition niche and the round piece on the right is where the 2cm Flak 30 sat. 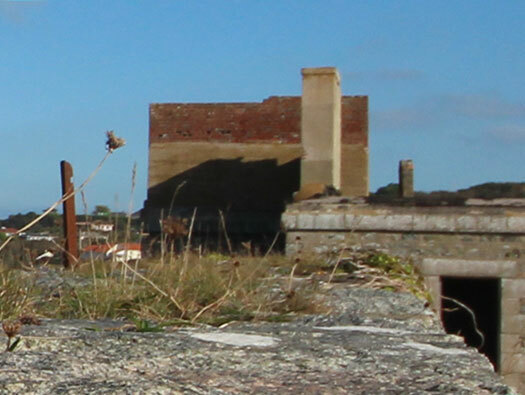 The small brick plinths are for water tanks used post war and nothing to do with the Flak. A round base for 2cm flak. Possibly a store, shelter or radio/field telephone space. Ringstand for ?? that was empty in late wartime air photos. It may have covered a large gap in the wall probably made as an easier entrance. Battery 4 gun embrasure for a I think 64pdr guns on garrison carriage. 4pdr guns on garrison carriage. Round base of the Flak mounting. 2cm Flak 30 without its carriage base where it can be bolted down to a concrete base. Ammunition niches down two sides. Base for a 2cm Flak gun. Tie down thread and nut. Hole in the centre for an electrical or telephone cable to the gun. 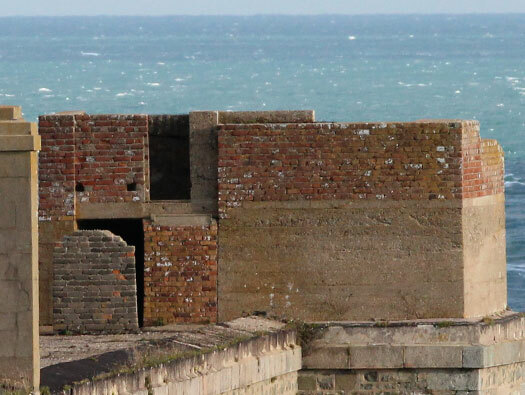 Gap in wall to Battery 3 with the Flak OP on the left with the broken roof and on the right a set of steel steps up the side of the inner wall. Getting to top of the ladder is the view over the top of the wall. What did I expect. 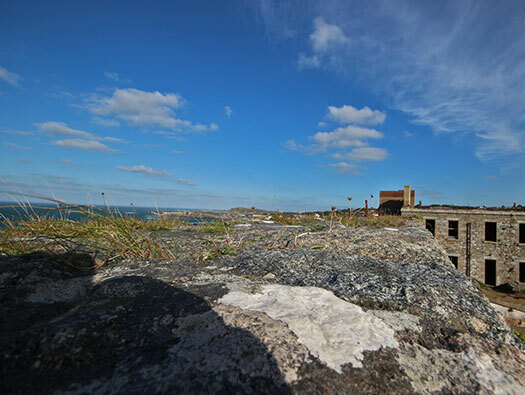 The brick tower on the end of the Officers barracks is the third 2cm Flak position. The third flak position using a concrete base and the topped off with brick. Another view of the flak position. Close up you can see the different forms of construction with ammunition underneath. Close up from the N/E side . 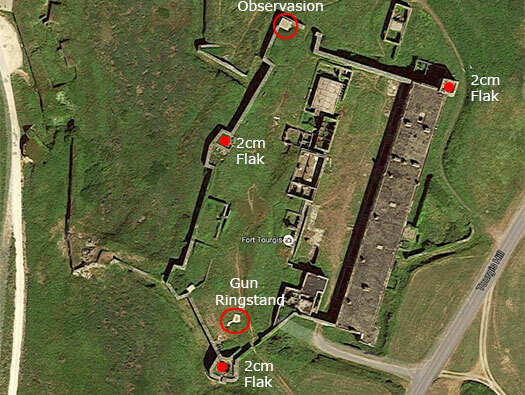 The parade ground and at the far end Musket loopholes and an entrance into Battery 3. A closer look at the far end with Musket loopholes and the forts door, like the main entrance it looks to be a double door and a drawbridge. You can see the hinges for inner doors and the pulley for a drawbridge. Also on the left a large iron bar to lock open the door still in place. Officer’s quarters on the left and then the men’s the est of the building. Windows on the outer side had loopholed steel shutter to close off if attacked. 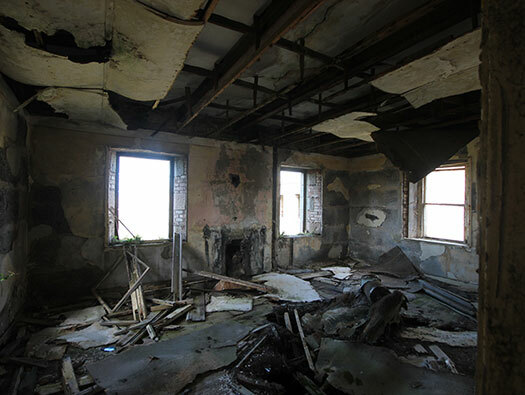 Looking into the Officers Quarters. 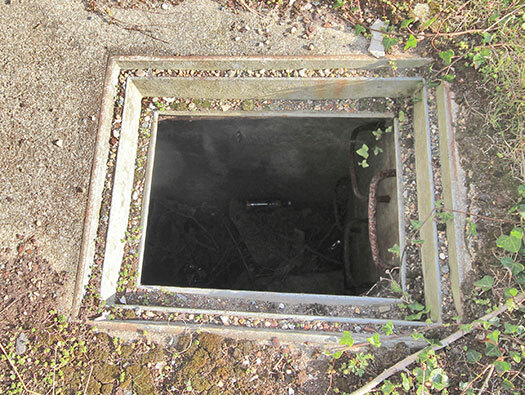 I think this is a coms man hole and not sewage as it has steel ladder down into it??. A basement down the steps. Working along another entrance to the men’s quarters. showing the inner doors. Basement with a concrete cover from WW2. Another view of the concrete cover. Another entrance into the Men's Quarters. Looking into another basement with iron railings still in place. The view towards the main gate. The last entrance into the Men's Quarters. The main gate, the other is on the ground. Not sure what this is yet? ?